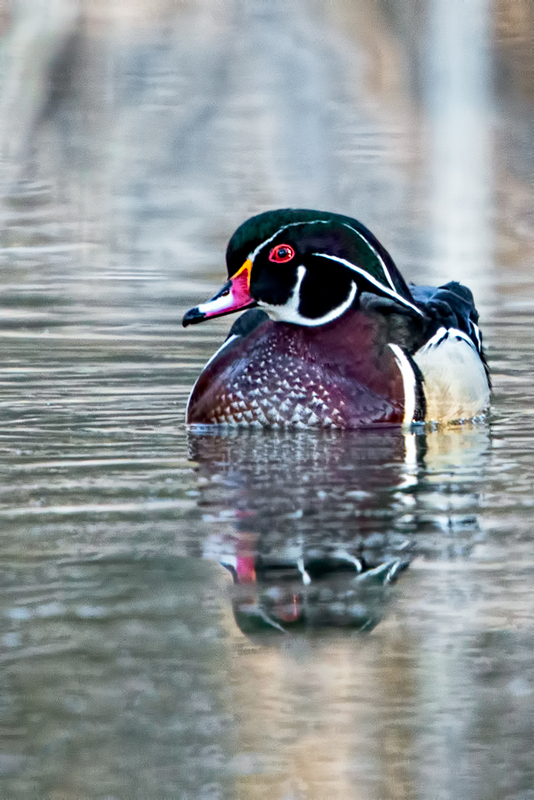 With the outside temperature at 27 degrees, it was tempting to stay in bed and not get up before sunrise to photograph Wood Ducks. 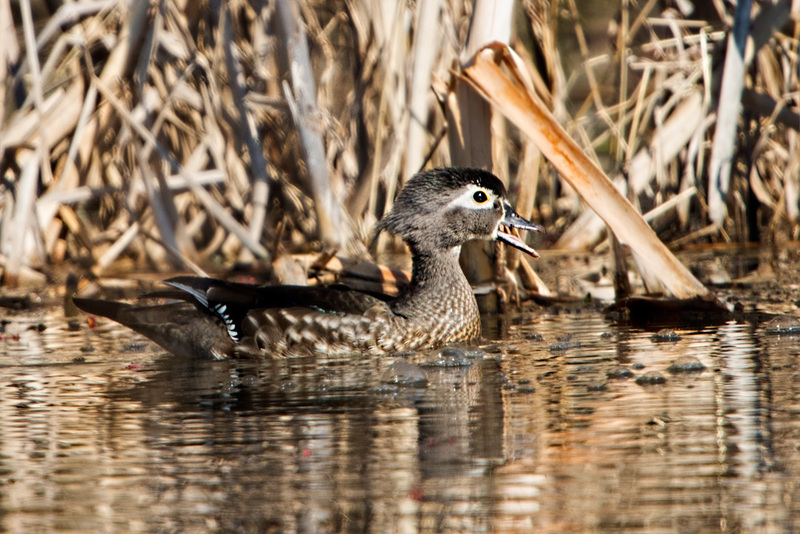 Making it even more difficult were the poor results of last week’s trip–a quick glimpse of one female Wood Duck and no photographs. Nevertheless, I got up, hoping it would be better. I arrived shortly after sunrise, meeting a friend in the parking lot. We mounted cameras and lens on tripods, equipped ourselves with secondary camera bodies and lenses, and headed to a beaver pond. While walking through the hardwood forest to the beaver pond, we searched the upper tree canopy, since we had seen several Wood Ducks in the trees on a previous trip, but we did not see any this time. 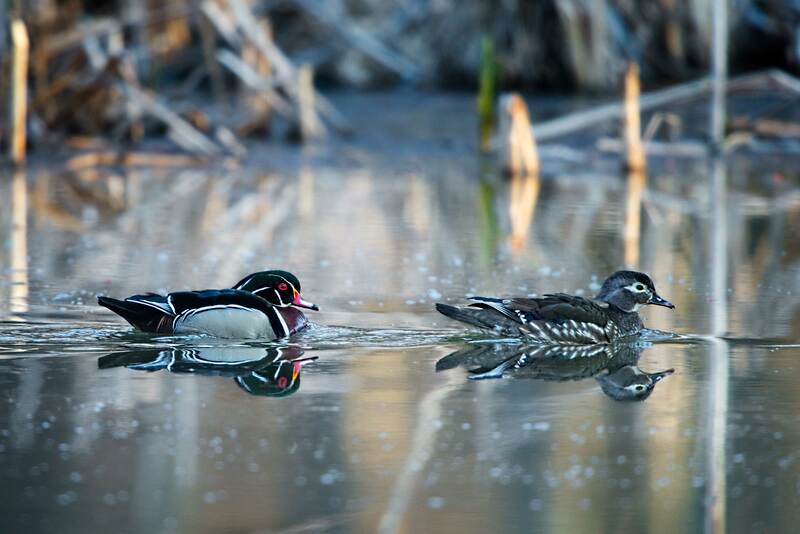 Shortly after arriving, a pair of Wood Ducks moved from behind a large clump of reeds and began crossing the beaver pond, weaving between reeds, logs, and fallen trees on the far side of the pond. Fortunately, there was no wind, and the pond’s surface was perfect for capturing the reflections of the ducks as they swam in small sections of open water. The ducks knew we were there and moved quickly, crossing the pond in no more than a minute or two. I tracked them through my camera lens as they swam across the pond, and when they were briefly in the open, I managed to fire off a number of (digital) shots. At one point, before entering an open section of the pond, the pair stopped behind some reeds, where the male watched us closely while the female preened her feathers and rested her eyes for a brief moment, which I captured. 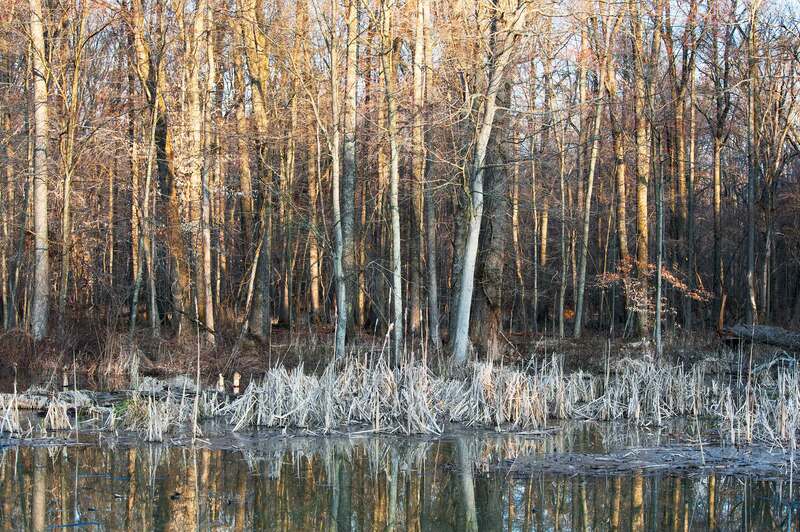 As the Wood Ducks neared the other side of the pond, they began to disappear behind reeds and trees, and were quickly out of sight. 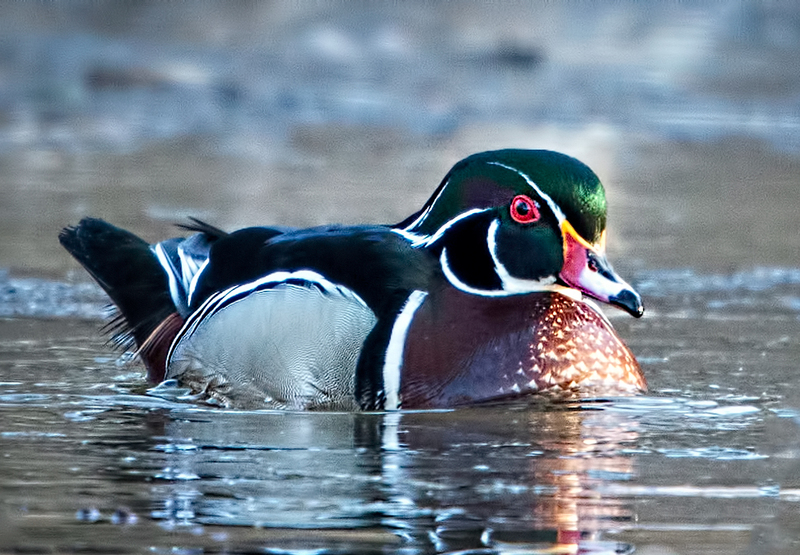 Other than a few brief glimpses of them or other Wood Ducks that flew quickly out of the forest and out of sight, we did not have another opportunity to see or photograph any more. That was most likely because, as the morning progressed, we attracted many other photographers and other people wanting to know what we were photographing. 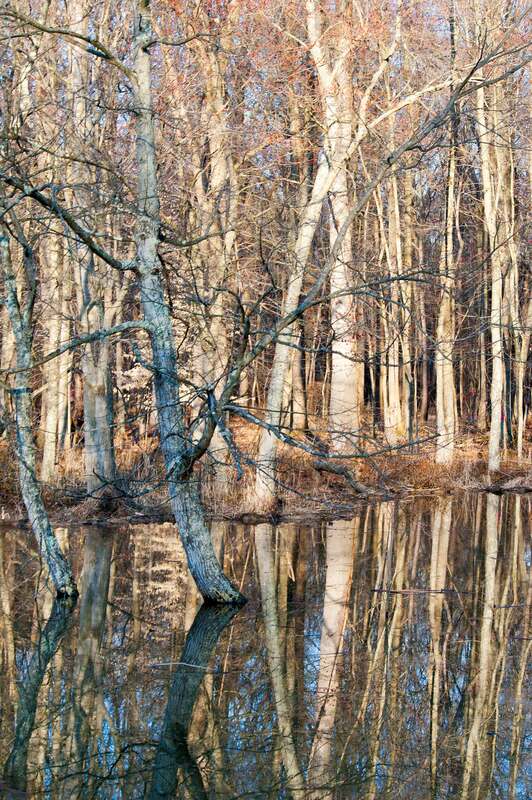 At one point, there were about ten photographers, counting ourselves, along the beaver pond, as well as other people. The quiet and solitude of the early morning had ended from the chatter of people and children. 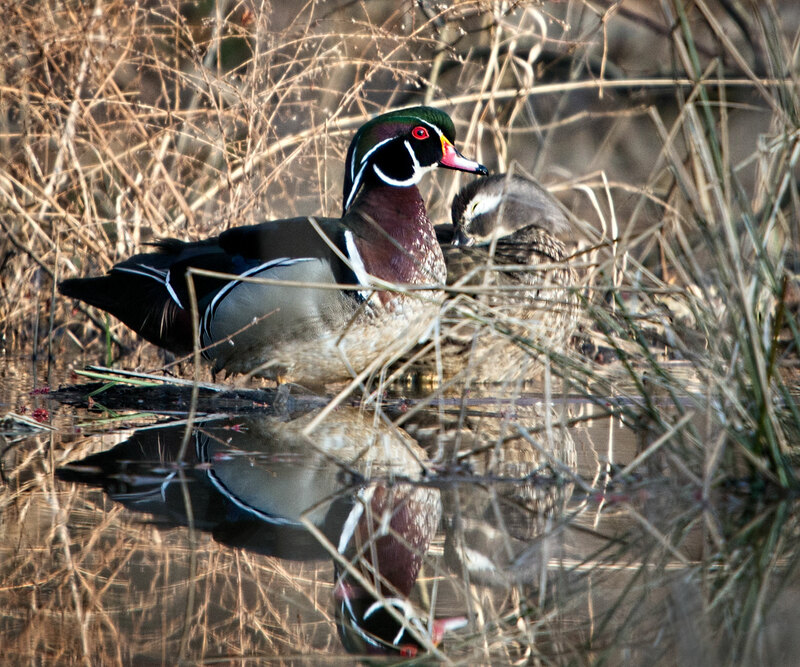 Wood Ducks are very skittish and wary of people, and typically, when they see people they very quickly hide or fly away. Therefore, since there were so many people, my friend and I packed up our gear and left about midmorning. As you can see from the images in this article, it paid off to get up and out early, before the crowds of people arrived. 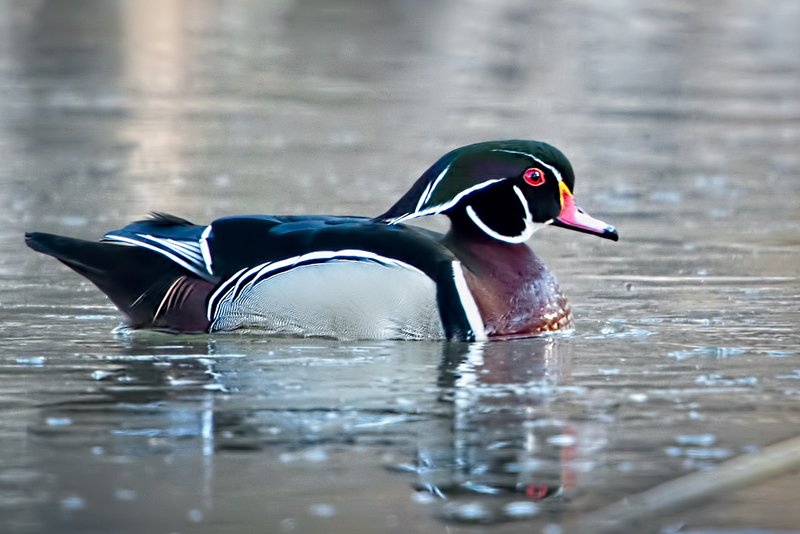 This entry was posted in Bird Photographs, Nature, Wildlife and tagged beaver pond, nature, Wood Duck, wood ducks. Bookmark the permalink. Excellent images Steve! Well done. Very nice shots. Patience and perseverance pays off! Now to capture shots of the fledglings as they leave the nesting box…. I hope I am there when it happens! Fun Stuff Steve.. I hope you get to capture the youngsters! 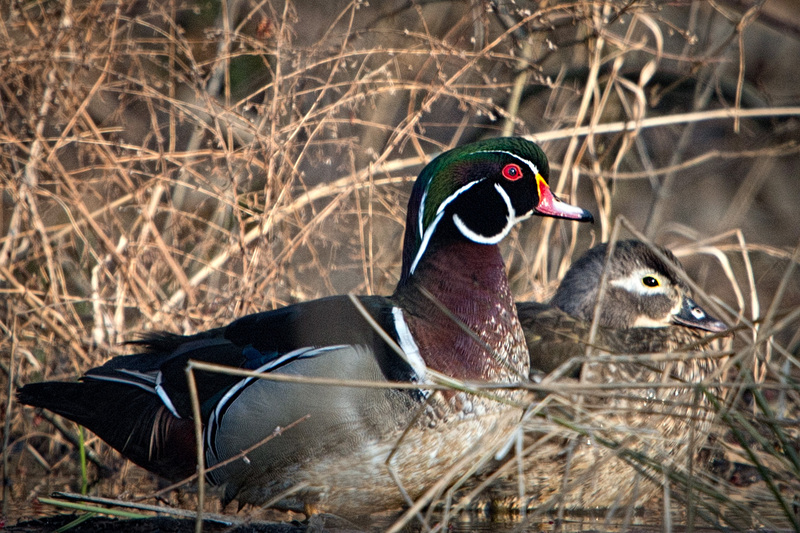 Great close up shots of the Wood Ducks. A beautiful bird! Hope you capture the babies, too! Great closeups of the ducks! Such a gorgeous bird! Can’t wait to see what the babies look like … hope you are there for the big event! A kind of strange beauty; unique and intriguing. Extrdaordinary photography. Cannot believe the clarity and beautiful colors, beyond description. Thanks for taking me along for the trip photographically. As everyone has said, wonderful images, Steve! Looking forward to more and perhaps even a view of the next generation.